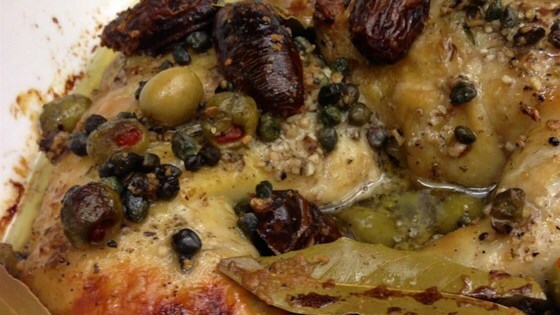 "A taste of the Mediterranean in one delicious baked chicken dish. This is a classic Chicken Mirabella recipe." In a medium bowl combine the garlic, prunes, olives, capers, olive oil, vinegar, bay leaves, oregano, salt and pepper. Mix well. Spread mixture in the bottom of a 10x15 inch baking dish. Add the chicken pieces, stir and turn to coat. Cover and refrigerate overnight. When ready to prepare, preheat oven to 350 degrees F (175 degrees C). Remove dish from refrigerator. Sprinkle brown sugar on top and pour white wine all around chicken. Bake in preheated oven for 1 hour, spooning juices over chicken several times as it is baking. Serve on a platter, pouring juices over the top, and garnish with fresh parsley. So simple and delicious, it had to be called happy. I liked this dish, however, my family didn't feel the same. They didn't think it was anything special. I might make this again, only adding more olives. Tasty chicken dish - my husband and kids loved it, too. You can use a little less brown sugar and it will still taste great.